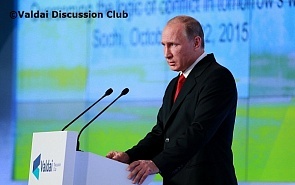 Vladimir Putin took part in the final plenary session of the 12th Annual Meeting of the Valdai Discussion Club. Transcript of Vladimir Putin's speech and Q&A session. The topic of this year’s Valdai conference is Societies Between War and Peace: Overcoming the Logic of Conflict in Tomorrow’s World. In the period between October 19 and 22, experts from 30 countries have been considering various aspects of the perception of war and peace both in the public consciousness and in international relations, religion and economic interaction between states. Vladimir Putin (responding to a question on the possibility of air defence missile systems in the hands of the Syrian opposition): This is an entirely valid question, I do not see anything here that could be translated into another category of wrong questions, and I will answer very pragmatically. As far as we know – although it would be great if I am mistaken – the American military are already providing anti-tank and anti-armour weapons systems and are training gunners. I think this is a major mistake. I believe that this weaponry will certainly fall into the hands of terrorist organisations. Moreover, as you know, our American colleagues simply chose to airdrop weapons and ammunition in certain areas. Who will receive this weaponry and ammunition? Who will use it? Against whom? There is no certainty; I simply know 100% that nobody can be certain of this, including those who do it. Even if it initially makes it into the right hands, tomorrow, it might and very likely will end up in the hands of ISIS or Jabhat al-Nusra or other similar organisations. I feel this is a big mistake. Is it possible to transfer anti-aircraft weapons or MANPADs? I hope not, because American leaders, although we disagree on many positions, are nevertheless sensible people and realise that these weapons could end up in the hands of those who will aim them against the American pilots who also fly over Syria – granted, they’re doing it unlawfully, but still do it. And I think at least this should stop them from transferring this kind of weaponry. As for certain types of aircraft – I have flown on them, I know what they are. Overall, I’m surprised that pilots are doing this. With those G-forces you can hardly move your head. And they need to not only control the aircraft but also control the weapons. Because the strikes are primarily made visually. The G-forces you experience with the aircraft’s sharp declines and rapid ascents are enormous; you can only move your fingers. This is the highest level of aerobatics, figuratively speaking. And these people certainly deserve our respect. Our service members in Syria, of course, are fighting terrorism and in this respect, protect the interests of the Syrian people, but not only that. First and foremost, they protect the interests of Russia and the Russian people. They are striking the militants and militant groups that are a threat to our nation. Of course, they are risking their health and their lives. And in this regard, they are all heroes, but they chose this profession of their own free will. It was their choice. I am proud of them. There is one more thing I want to say. Fifty years ago, I learnt one rule in the streets of Leningrad: if the fight is inevitable, be the first to strike. And I assure you, the treat of terrorist strikes against Russia has not become greater or less due to our actions in Syria. It was already there and it still is, unfortunately. We were not taking any action in Syria. What caused the terrorists to strike the railway station in Volgograd? Nothing. Simply their people-hating mentality, their attitude toward people’s lives, the fight against Russia itself. And so it is better for us to fight them there, as I already said, rather than await them here. Vladimir Putin: Regarding the Minsk Agreements. I believe (and I have already said this) that there is no other way if we want to achieve lasting peace in the southeast of Ukraine and restore the country’s territorial integrity, there is no other way but to comply with the Minsk Agreements. Can Germany play a positive part here? It can. I believe that the Federal Chancellor of Germany and the President of France are being sufficiently objective today, and though it is obvious that for political reasons they support the current Kiev authorities, in my opinion they have a sufficiently fair assessment of the situation. They already have the understanding that the problems that have accumulated there are not only black and white – it is much more complicated. I spoke about this in New York at the meeting with my American colleague and partner – the President of the United States of America. I said that without the participation of Europe and the United States it would hardly be possible to resolve the situation. There is no point in accusing Russia of non-compliance or failure to motivate the authorities of the unrecognised republics in the southeast of Ukraine to some action to implement the Minsk Agreements, if the Kiev authorities fail to comply with the key terms of those agreements. And the Kiev authorities are not in compliance. This is no secret, it is something we often speak about, but I will say again what I mean when I say that the Kiev authorities are not complying with the Minsk Agreements. The first thing that needs to be done to achieve a political settlement is amending the Constitution of Ukraine, this is stated directly in the Minsk Agreements, it is important: upon agreement – as it says – with these territories, the unrecognised republics. The authorities in Kiev amended the Constitution without any agreement with these unrecognised republics, insisting that they have reached agreement with the Venice Commission. Fine, but the Minsk Agreements say nothing about the Venice Commission, they require agreement with Donbass – something that has not been reached. Second. The amendments should be permanent. Actually, they are made in transitional provisions, and in our view this means that it is a temporary measure. Our opponents speak of the opposite. How exactly was the Constitution amended? In essence the law on special status for these territories has been added to it, which has already been passed. When I ask what law is that, the German Chancellor, the French President and the Ukrainian President all confirm this is the law that the Ukrainian Rada has already passed. I asked if this was permanent, and they said it was. So then, I ask them if they know that the law was passed for only three years, and one year has already passed, and Mr Poroshenko confirmed this. My European partners expressed their view that if the law was added to the Constitution, it should be permanent, but then this should be fixed in the Constitution. Next. There was an argument about elections in the unrecognised republics. The Minsk Agreements say the Rada should pass a law on elections and they should be held in accordance with Ukrainian law. However, this law should also be agreed upon with these unrecognised republics. They sent in their proposals three times, but received no reply. Moreover, the law that was passed says clearly that it will not apply to elections on these territories. Then what should they do? That is why they declared they would hold the elections on their own. We have managed to convince both territories to postpone the elections. We agreed that the law should be drafted together with Kiev. But this has to be done. Finally, the Minsk Agreements say clearly: within 30 days of their signing the Rada should pass a resolution to introduce a law on special status. As I have said, it was passed by the Rada earlier. What did our partners in Kiev do? They approved the resolution passed by the Rada and formally, they were in compliance with the Minsk Agreements. At the same time, without agreement with Donbass they passed another article – article 10 of that law that says that it would only come into effect after the elections there, in other words they again put it off. These are simply manipulations. This is exactly what I said to my Ukrainian partner. These are nothing more but manipulations. Formally, they seem to have complied. As the classics of Marxism-Leninism used to say, correct in form but mockery in essence. Finally, they should pass a law on amnesty. If everyone keeps telling us that the elections have to be conducted in line with OSCE standards, they should not forget that OSCE standards envisage one important condition of the election campaign: nobody can be criminally persecuted, while all the leaders of the Lugansk and Donetsk people’s republics are under criminal persecution. However, this is something everyone agrees on – both our American and European partners: that the law on amnesty needs to be passed. It has not been passed. The Minsk Agreements say this directly. The reference to the fact that it is covered in the law on special status does not work because the law is not in effect. A reference to having it covered in the law on future elections does not work either because there is no such law. There should be a separate amnesty law. I doubt that anyone here would say this is impossible. This is an international standard – you cannot have elections where people with active or passive voting rights are subject to criminal persecution. There are a number of other issues, but they are not being resolved; the ball, so to speak, is on the side of the Kiev authorities. This needs to be done and it can only be done by the Kiev Government and the Kiev President together with their European and American partners, not with Moscow. I apologise for taking such a long time, but I had to make my position clear. Vladimir Putin: The first question deals with the crisis, problems in the economy and its development. As we all know from the forecasts of respectable international organisations, including economic and political ones, like the UN, the World Bank and the IMF, the global economy is not developing at the rate we all dreamed of. In this sense, the entire world economy is experiencing problems. Russia’s economy is experiencing several problems at once, going through a number of trials. These have to do not only with the limitations that are often mentioned, the politicised limitations on the economy, the so-called sanctions, which do play a certain part, though not a decisive one. The most important factor limiting growth, reducing economic growth rates is of course the fall in prices of our traditional exports. However all this does not apply to Russia alone – it concerns practically all developing markets. The Russian market is also affected, though possibly slightly less than some other developing markets are if we look at statistics. What should we do? You have already said it yourself and mentioned that here in Russia we frequently and consistently speak of the need to diversify the economy, making it more diversified focusing on high technology sectors. True, progress here is slow. Is there anything positive happening here? There is. Here is an illustration. If, say, some 5–7 years ago the oil-and-gas sector accounted for 14 percent of the GDP, today its share in Russia’s GDP, in the national economy is 9 percent. For comparison, I would like to say that the oil-and-gas sector, say, in Saudi Arabia accounts for 45 percent, if I remember correctly, while in some states of the Gulf it reaches 50 percent, while in Venezuela it is 30 percent, and in this country it is 9 percent. As you see, the difference is great. For the first time, despite all the difficulties we encountered in the last quarter – unexpectedly for us, maybe, but such was the effect of our efforts, and I will explain about the efforts in a moment – we saw a growth in engineering product exports against the overall drop in production in this sector of the economy. However, exports of engineering products have grown. What are the current problems? The thing is that our economy, having come across this situation on the external market, is not structurally ready to maintain the required growth rates. Certain industries were affected and we believe this requires special attention. I will tell you what we are doing here. Primarily, this is the industry. In some branches, the drop reaches 10 and more percent. This causes special concern, but we know what to do here as well. Finally, we need to focus on the national currency, something the Central Bank is doing quite confidently. In this connection, I believe that those experts and Government members who say that we have passed the peak of the crisis are right. Now we need to focus on the factors I have just mentioned, on supporting the most affected sectors – this includes construction, engineering, car manufacturing and some high-tech construction branches. For this purpose the Government has allocated an additional 150 billion rubles, another 300 billion rubles have been allocated to agriculture; therefore, there is sufficient financial support. We have to carry on with the work we have been doing over the past years. The Central Bank, as I said, is doing its part to stabilise the national currency – another factor that allows us to say we have achieved certain stability. The exchange rate of the national currency does fluctuate along with the changing oil prices, but overall it has stabilised. We are maintaining a positive trade balance despite all the difficulties. The Central Bank has rather significant gold and currency reserves – over $370 billion. We have significant reserves in the Government funds – over $70 billion in one reserve fund and $74 billion in another one. True, the way we are structuring the tactics of our economic development, we will be cutting into those a little, but nevertheless, by the end of 2018 I am certain we will have sufficient Government reserves in addition to those of the Central Bank. Over the previous period, the previous quarter, the budget deficit was only 1.5 percent. Inflation is going down: last month it was 0.5 percent, I believe, the end-of-year figure will be significant, around 11.9 or possibly 12 percent. However, we proceed from the assumption that in the following years there will be a downward trend. Actually, the trend has begun and we need to maintain it. Generally, we will try to maintain the macroeconomic indices using a very conservative approach to budget spending, bearing in mind that salaries have gone down a little in real terms. I am certain they will grow along with economic growth. However, with this in view we need to switch over (we will be making appropriate legal decisions now) to a more targeted approach to social support. This is a rough set of instruments that we intend to use to ensure further diversification and economic growth rates that we clearly need. Now about Syria. You said the goal of the USA is to get rid of al-Assad, while Russia’s goal is to support al-Assad, right? It may be true that the USA have the goal to get rid of al-Assad. Our goal is to combat terrorism and to help President al-Assad gain victory over terrorism, which in turn would create conditions for the beginning and, hopefully, successful implementation of a political settlement. I believe this is the only right way out.